HELLO, OHIO: Tonight marks the third of four meetings with the Monsters this season, and the first of two scheduled visits to Cleveland’s Quicken Loans Arena. 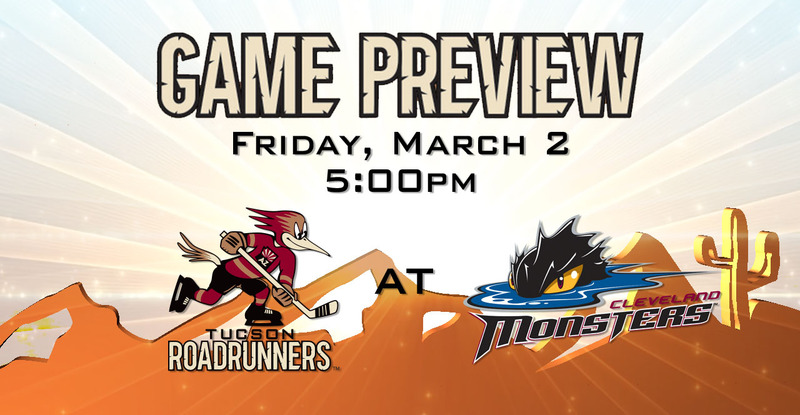 The Roadrunners are playing the second of a three-game road trip; they’re coming off of a 3-2 loss to the Grand Rapids Griffins on Wednesday. 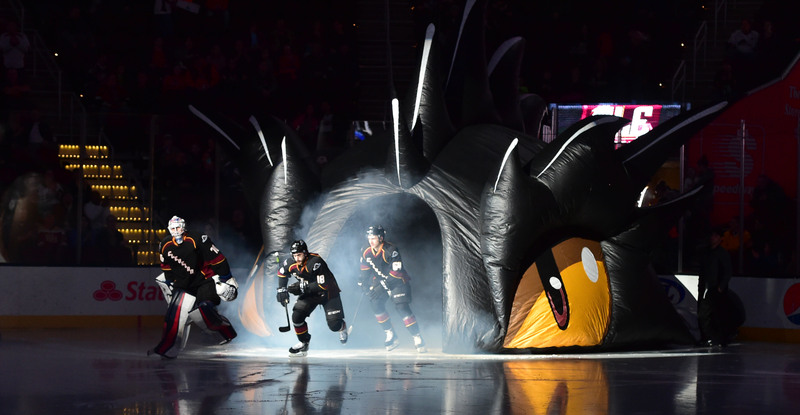 The Monsters are playing the third of a four-game home stand; they’re coming off of a 5-3 win over the Stockton Heat last Friday. OVERTIME TREND: Seven of the Roadrunners’ last 15 games have extended past regulation; they’ve won all but one of those contests, going 5-1 in overtimes and 1-0 in shootouts. Overall, the Roadrunners have played past regulation on 13 occasions this season, coming out on the winning side nine times. Both of the Roadrunners’ previous meetings with the Monsters this season have gone to overtime, a 2-1 OTL on November 3, and a 3-2 OTW on November 4. NEW TERRITORY: Tonight’s first-ever visit to Quicken Loans Arena marks the 10th opposing building the Roadrunners will have played in this season. The team enters the evening with a 16-6-1-1 mark on the road, calculating in at a .708 win percentage, which is the fourth best in the AHL. The Monsters are 11-15-2-0 on home ice this year. PROJECTED LINEUP: The team held an optional morning skate at Quicken Loans Arena ahead of tonight’s game. Per club policy, specifics regarding the team’s lineup will not be published until 3:00 PM this afternoon. FAMILIAR FACES: Forwards Jordan Maletta and Carter Camper, acquired prior to Monday’s trade deadline, participated in their first full practice with the Roadrunners on Thursday. Both could make their team debuts this weekend against their former team in their former home building. Maletta registered four assists in 28 games with Cleveland this season; Camper led the Monsters in scoring at the time of the trade, 42 points (13G, 29A) to his name in 53 games played. Camper scored the overtime game-winning goal for Cleveland against the Roadrunners on November 3 at Tucson Arena. THE LAST TIME AROUND: In the teams’ previous meeting on November 4 at Tucson Arena, the Roadrunners defeated the Monsters in overtime, 3-2. Mike Sislo opened the scoring and Nick Merkley added a pair of goals, including the overtime-winner as he took advantage of a botched play by the Monsters' Brad Thiessen. Hunter Miska stopped 21 of the 23 shots he faced in the loss. The Roadrunners are 1-0-1-0 against Cleveland this season. IN THE NICK OF TIME: Nick Merkley returned to the Roadrunners’ lineup Wednesday night in Grand Rapids after missing 11 games (upper-body) and 16 of the team’s last 17. His presence was felt almost immediately, hooking up with Dylan Strome for a second period goal, dishing out a slick assist to the team’s leading scorer. PLAYOFF PUSH: The Roadrunners enter the night tied in having the second-lowest magic number (32) in the Western Conference. The Monsters are all but out of playoff contention; their .406 win percentage is dead-last in the Western Conference and the second worst in the league.